Through exclusive 35th anniversary sponsorship opportunities, companies gain high visibility in a variety of ways, from prominent roles on the podium to product placements. ICFJ works closely with sponsors to create long-lasting relationships. In this premium sponsorship role, your company representative introduces one of the honorees from the podium, enjoys premium seating, and gets top branding at the event and in all publicity efforts. The kickoff event allows a sponsor to gain a high profile by showcasing its services and products, not to mention a specially branded cocktail and appetizers. Guests congregate at this highly popular post-dinner gathering, where you have a chance to address the attendees and honorees. We offer special branding, live music, cocktails and a dessert buffet. Your brand will appear on screens with social media streams that actively engage guests throughout this event. 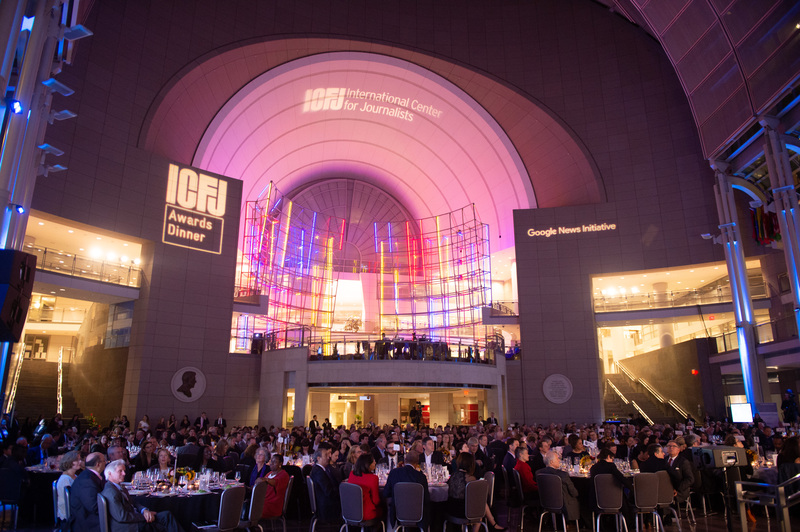 Spotlighting ICFJ’s milestone year, this level receives premium seating and high visibility, from recognition from the podium to displays of logo on the two main screens in the ballroom. Promote your brand and show your support for ICFJ in the dinner program distributed to more than 600 guests.